I’m not going to include a picture because I don’t have one available. Think of this an informational post. Research. My eldest daughter got a new haircut/hairstyle/hairdo this week and, since she’s been staying with her grandparents, last night was my first chance to see her. First, it took an 8-year-old girl and made her look so much more mature and worldly that I could see well past the tweens and straight into her adult self. It was off-putting, breath-taking and pride-making. She seemed elegant, spoke more eloquently and had this air of poise about her. Funny how a new look will do that to a person. 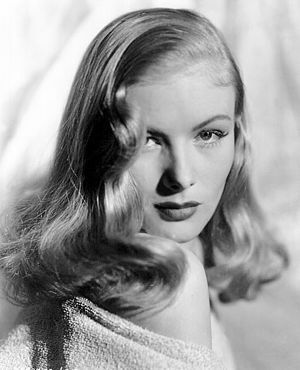 I also noted that she looked just like Veronica Lake (only with her hair swooping in the opposite direction). My wife had no frame of reference but both my in-laws instantly smiled and shook their heads knowingly. Maybe I’m just a proud father and – out of context for me – willing to draw attention to my daughter’s beauty (I prefer to tell her how smart or athletic she is [both true] as opposed to complimenting her appearance). Anyhow, I’m still not posting a picture [don’t get creepy] but I will link to some Veronica Lake photos. So while I don’t want to solely focus on Rae’s beauty (except for the purpose of this post), I do hope she becomes a strong, confident woman willing to stand by her convictions. I should be so lucky (and I’m already pretty lucky).